Hi, my name is Abbey, I write a blog, and (occasionally) I get paid for it. And you know what else? I'm not ashamed. Not at all. First things first: if you just blog for the hell of it, because you love writing and sharing your life online, that's FAB! You do you! You don't have to take on sponsored opportunities, you just keep doing what you love! But it doesn't mean that I am any less of a genuine blogger just because I get paid from time to time. It doesn't mean that anyone has the right to judge me or make snarky comments just because my path through blogging is a little different to theirs. Do we begrudge Nicole Scherzinger for the orgasmic Muller yoghurt adverts? Do we sneer at Cheryl for promoting L'Oreal Paris hair products? What about all the Premier League footballers who film TV ads for Gilette razors? Or Gary Lineker with his hundreds of campaigns for Walkers Crisps? We are so used to seeing celebs everywhere, advertising products, that we barely even bat an eyelid. But if it's ok for A-listers to cash in on their influence and use it to bolster their income, why is it not ok for bloggers to do the exact same thing? Many bloggers and YouTubers out there have obscene followings these days, and that is AMAZING! We follow them because they produce engaging, thought-provoking, and entertaining content, putting in long hours and huge amounts of effort to ensure that you, their audience, have something to enjoy on the Internet during your Saturday night in. I think you'll find that every single creator will say that they do this because they love it (and so do I! ), but I believe that people who put in all this work also deserve to be paid. Creatives in all sorts of industries get paid for their work: movie script writers, makeup artists, novelists, musicians, designers... The list is endless! So why not bloggers too? This isn't to say that I think every blogger and YouTuber should write sponsored content and nothing else. But there is nothing wrong with being paid for a post which relates to the underlying ethos of your blog. Sponsored content can be among the most relevant, valuable, and interesting blog posts out there. By adding a sprinkle of creativity, which is what us bloggers do best, a seemingly dull and dry topic can become something relatable and engaging. For example, I've written two of posts on behalf of the same double glazing company in the past couple of months, but that doesn't mean I've just banged on endlessly about the amazing qualities of that extra pane of glass. I incorporated the client into posts about Green Living and Interior Design, offering up much more for my audience than just a sponsored paragraph. I put a lot of effort into those posts, and I don't care if I come across as big-headed when I say that I think I earned the amount I was paid. If I'm being completely honest, I think that a lot of sniping about sponsored content comes down to one thing: jealousy. I fully admit to sometimes experiencing jealous feelings myself. It's a natural human emotion and it can be hard to control. But the real problems begin when people see a blogger writing a sponsored post, think "why has SHE been offered that chance and not me?? ", and allow the green-eyed monster to take over. They turn to bitching about sponsored content and how "horrendous" it is in order to make themselves feel better. But we all know full well that had the person dishing out all the hate for sponsored posts been offered that exact same opportunity, they would've jumped to take it, just like the blogger they're hating on. Really though, there's absolutely no need to diss a sponsored post just because you weren't offered the chance to write one. One blogger might have a sponsored opportunity this week, but next week or the week after, it could be your inbox that the all-important email lands in! So if you want to write sponsored content, why waste energy on bitching when you could spend that time working on scoring similar opportunities for yourself? Get writing emails to companies, contact brands you love on Twitter, let the success of others' sponsored posts motivate you and not divide you! You don't want to write sponsored content? Don't. Do your own thing! 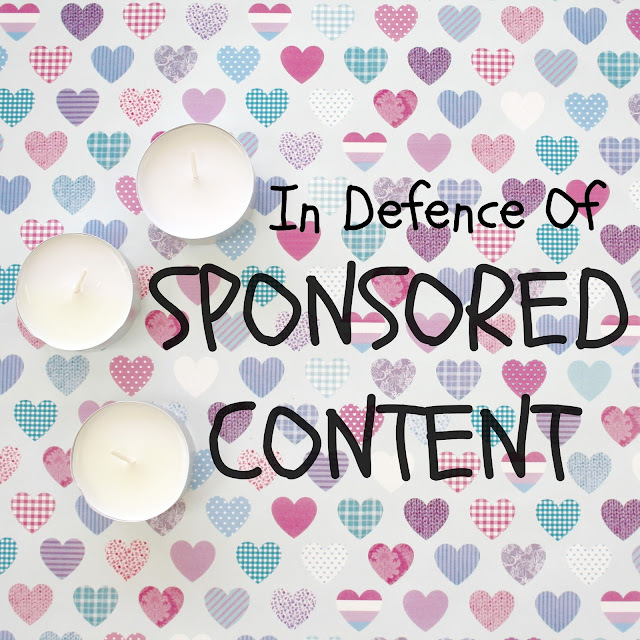 You do want to write sponsored content? Go out there and get it! Just don't denigrate others for taking those opportunities, either because you don't want to take your blog in that direction, or because it wasn't your time on this occasion. Let's raise each other up and APPLAUD the bloggers who are able to earn enough from their content to make writing their full-time career. These guys and gals show just how far blogging can take you, and I for one find that darn right inspirational. What are your thoughts on sponsored content? Let's chat in the comments!